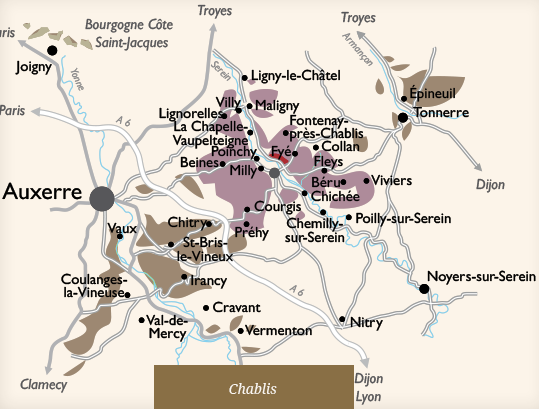 The vineyards of Chablis are located in France’s Yonne department, in the northern part of Burgundy. Soil The vines grow on very steep, south-facing slopes in calcareous clay soil with many Kimmeridgian outcrops. Grape variety 100 % Chardonnay. Vinification Vinification takes place essentially in temperature-controlled tanks with some barrel ageing (a maximum of 10 to 15% new oak) so as to respect the expression of the terroir. Robe Lovely, delicate golden colour. Nose The first nose features a briny profile, opening up to a fruity touch of pear and aromas of mild spices such as vanilla and star anise. Palate Smooth, silky texture showcasing the Kimmeridgian terroir, complex without being overly exuberant. Serve with On its own as an aperitif, or serve with thinly sliced Parma or Serrano ham. It is a perfect match for seafood, white-fleshed poultry and fresh asparagus. Serve at Serve between 10 and 12°C to best appreciate this wine’s freshness and minerality. Cellaring potential From 3 to 5 years.